The all-Merino Pocket 200 joined my gear collection after I began noticing a problem with my fleece hats: they weren't very comfortable to sleep in. Fleece (especially windstopper/windpro) doesn't breath that well, and if you like to sleep in a hat when you're outdoors for extra warmth, as I do, fleece just doesn't feel very good as the night wears on. So I went looking for a Merino hat, figuring a good wool hat had to be at least as comfortable as a good wool shirt—which is to say, pretty comfortable indeed. Thus I found Icebreaker's Pocket beanie, and it's been happily ever after for the two of us ever since. Just in case you're the last person on the planet who's never worn Icebreaker Merino, it is goat (okay, maybe it's a sheep) wool (like Smartwool) that is completely itch-free. High-end Merino like the Pocket Beanie feels almost identical to cotton against the skin. It really is sort of a textile miracle—especially for those of us who remember being forcibly dressed in stiff, itchy-itchy-itchy wool sweaters for church every Sunday. The other big perk of Merino is its ability to keep you warm even when it gets wet, unlike cotton, and also unlike synthetics (sometimes there is some confusion about this; synthetics dry faster, but lose more insulating ability when wet). Merino creates its own microclimate against your skin, helping you stay warm when you're cool and cool when you start to get warm. 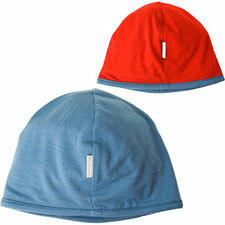 At 1.5 ounces (measured), the Pocket Beanie is light on your head and unnoticeable in your pack or pocket.